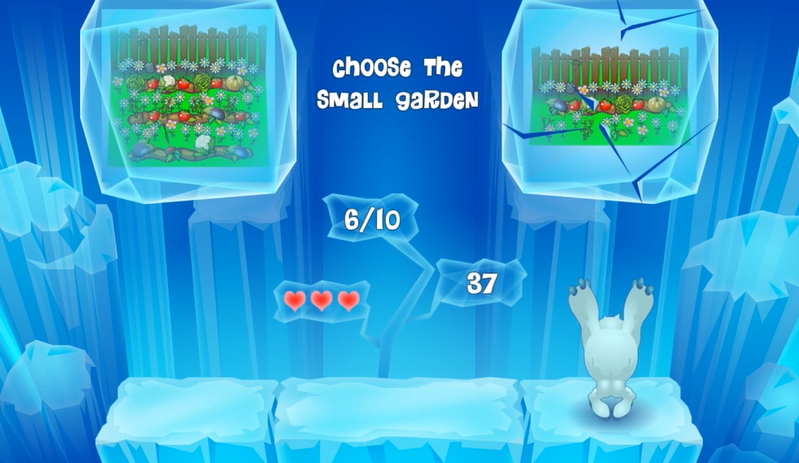 In the game “Yeti Jump” the child is called to choose the correct image among two displaying images, in order to give an answer to an audiovisual question (e.g. the empty basket), that appears at the top of the stage. The child can move left or right on an ice trail, trying to place himself and jump under one of the two ice cubes that contain the images. The two images display objects that differ in terms of specific attributes (taller, longer, thicker, etc.) or in terms of quantity. The Yeti has to jump one, two, or three times (depends on the settings), in order to break the ice cubes and reveal the correct image. This game is ideal for improving children’s critical thinking and mathematical vocabulary development related to concepts such as “big, small, short, tall”, etc., empowering attention to audio-visual stimuli and reinforcing visual-motor coordination, side walking and balance.